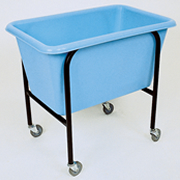 Used in laundries, laundromats, garment factories, or anywhere smaller loads are transported. Elevated to minimize bending and stooping. Removable liner for cleaning, emptying and replacement.